The household items used in the olden times of the 18th and 19th centuries are a far cry from what we are used to today. 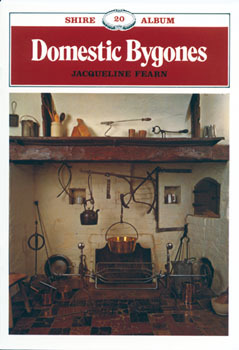 The bygones described in this book range from fire irons and the equipment used for cooking on the open fire to the moustache cup and the goffering stick. They are placed in the context of the domestic life of the period, describing how they developed and how they were used. Such obsolete household utensils are now valuable collectors items that are both decorative and relatively inexpensive. This little book features informative sections on preparing food, eating and drinking, cooking at the fire, washing, and more. It is a fascinating slice of history that is bound to be enjoyed and appreciated by all.